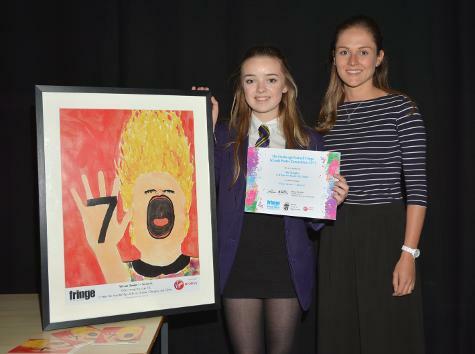 Orla Henaghen in S2 has been selected from 5000 entrants to provide artwork which will be used at this year’s Edinburgh Fringe festival. The 70th year anniversary is a special occasion and Orla’s work will feature as one of three front covers for the official programme. With almost 400,000 copies of the programme currently in production this is a big achievement for both Orla and the school, as the poster will be seen by thousands of visitors at the Edinburgh Fringe Festival in August. Our school will receive a prize of £250 cash and an exclusive workshop with a contemporary artist will allow us to continue to promote the expressive arts and motivate our young people. Orla’s success is a testament to the excellent work in the art department and her class teacher Miss Dominick in particular. We would like to congratulate Orla and thank her for her outstanding contribution.